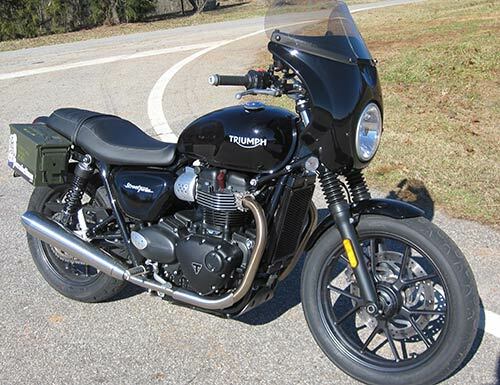 The classic shape of the Scout Fairing perfectly complements the retro styling of the new Triumph Street Twin! It is the optimum size to give great touring protection, better fuel economy and range with the 3.2 gallon gas tank. 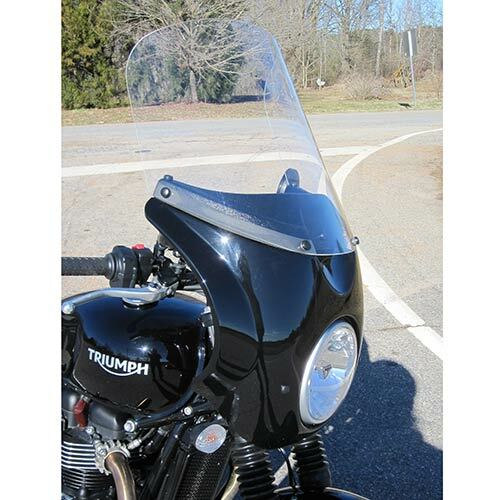 The Scout Fairing has a built-in low drag air balance vent that equalizes pressure behind the windshield for a smoother, quieter riding environment. The 20 inch wide fairing weighs only 4.5 pounds (with the 10 inch windshield as shown). For long distance protection, taller touring height windshields are easily swapped with 4 screws. The Scout Fairing comes complete with your choice of shield height and everything it takes to mount it.